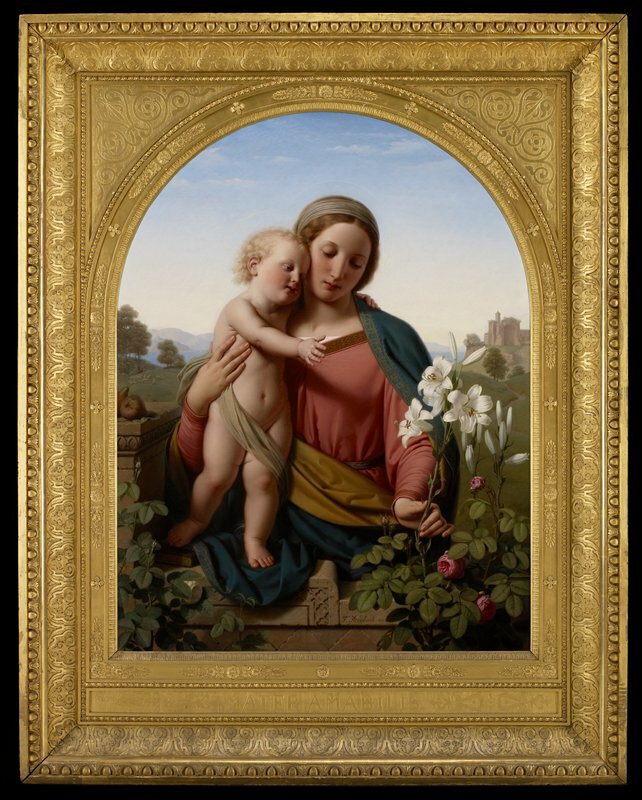 Ittenbach is considered one of the leading religious painters in 19th century Germany. A devout Roman Catholic, he traveled throughout Germany, painting altarpieces and artworks intended for church decoration. Popular among the German Catholic nobility, Ittenbach painted in a precise, realistic style influenced by Netherlandish and Italian Renaissance art, continuing the tradition of the Nazarene school. The Madonna and Child, with its delicate coloring evocative of Raphael (1485-1520), is replete with traditional Christian symbolism. The flock of sheep in the background is the customary symbol for Christian faith and worship. Lilies, the flower of the Virgin Mary, signify purity, innocence and immortality. The red roses invoke Christ's future martyrdom, and the figs are indicative of Christ's passion. The frame, probably designed by the artist, is inscribed "Mater Amabilis," meaning "Mother, worthy of love."